She was a perfect baby and her parents chose a name to match–Chrysanthemum. She thought her name was “absolutely perfect” until the first day of kindergarten when she finds herself in a world of strange new names such as Sue, Bill, Max, Sam, and Joe. That would not have been so bad except for mean-spirited classmates who tormented her, sending her home in tears day after day. 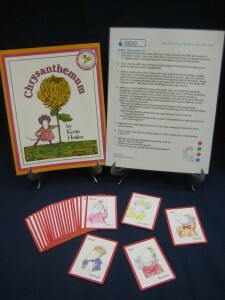 The class then learns that their popular music teacher not only has a whopper of a name herself—Delphinium—but also plans to name her expected baby the prettiest name she has heard—Chrysanthemum. Kevin Henkes’ illustrations are “absolutely perfect” for the story’s lighthearted and tender theme. This sensitive story will strike a chord with young children, particularly those who also have difficult or unfamiliar names. Activity—Alphabetizing the names of the mice with beautifully drawn illustrations. Two sets of game cards, one with English names and one with the Spanish names are included in the literacy kit. A suggested alternative activity is to classify the pictures of the mice.